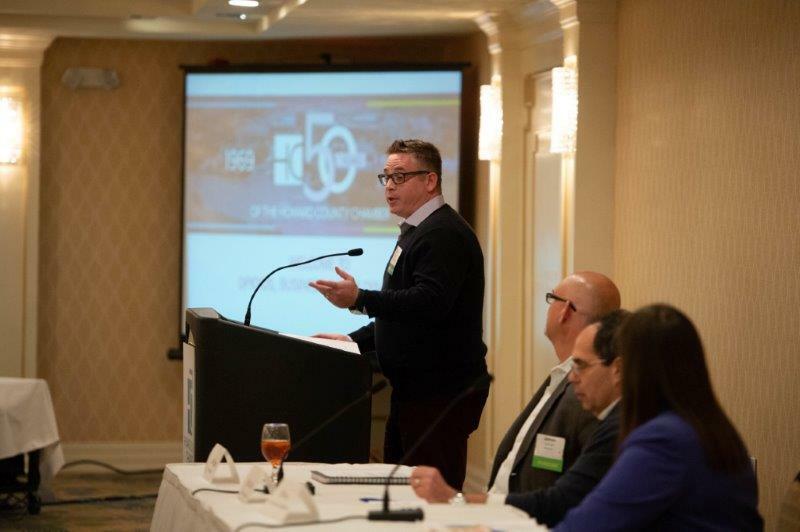 The weather was less than ideal, but that didn’t stop our members and members of the community from attending our first member lunch of 2019, focused on Opioids, Business and Employment. Barbara Allen, Chair of the Howard County Opioid Crisis Community Council and founder of James’ Place, named for her son, who lost his life to the disease of addiction, started the discussion by talking about the work various organizations are already doing in the fight against addiction. Allen then introduced moderator Zach Snitzer, co-founder of the Maryland Addiction Recovery Center, who is also in recovery. Snitzer spent the next hour asking panelists including Jef Fagan, Principle Attorney, Offit | Kurman, Bob Claire, General Manager, Mobern Lighting Company and Erin Roth, Deputy Assistance Secretary, Dept. of Labor, Licensing & Regulation, questions about substance abuse and its effects on the business community. The conversation was powerful and opened many eyes to the resources available for employers, employees, human resources professionals and others. While the discussion was productive, the topic is so broad that there is still much to learn for all of us. You can learn more about some of the resources available through the county government here.